Outdoor step lights are an important feature for every Scottsdale home. They provide safety on dark nights and are visually stunning, adding décor to any house. Step lighting can be as simple or artistic as you desire. Here are 4 outdoor step lighting designs. Similar to under cabinet lights for your kitchen, you can install under step lighting for any stairs outside. These subtle and discreet lights provide ample illumination without drawing any attention to the fixture itself. 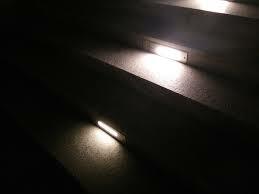 Under step lighting can be installed beneath the extended rims of stairs. LED is always a smarter choice compared to incandescent light bulbs. While LEDs typically cost more than light bulbs, they last much longer. Typical bulbs last 1,000 hours while LED bulbs can last 25,000 hours. LED step lighting can also include motion sensor features, making them especially helpful on dark, Scottsdale nights. Step lighting on stone stairs offers homeowners many options. If the stairs aren’t floating, lighting can be installed on the side walls—one for each step. These lights can be installed either on the surface of stones or inside the walls to create an enchanting and magical look. Step lighting on wood texture can be applied or installed in multiple ways. One option is the under step lighting, giving your wood stairs a warm glow. Low voltage wooden step lights can easily be found in Scottsdale and like stone step lighting, can be applied on the sides of a wooden staircase. Premier Lighting offers a multitude of step lighting for locals in Scottsdale. Our wide variety and friendly experts give you tons of options for your home. Contact us and visit our Scottsdale showroom today to get started on your outdoor lighting design.